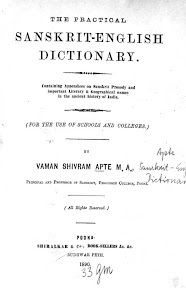 The Practical Sanskrit-English Dictionary : containing appendices on Sanskrit prosody and important literary & geographical names in the ancient history of India / by Vaman Shivram Apte. - Poona : Shiralkar, 1890. - 13, 1196 S.